**The printing errors in Pasos 1 Fourth Edition have been corrected**Pasos 1: Spanish Beginner's Course is a multi-format Spanish adult learning programme for classroom and home use. Fully revised and updated for this new edition, the course includes a coursebook, course pack, activity book and CD and DVD set plus online activities. What do I get?The Pasos 1 Activity Book has been revised to tie in with 4th edition of the course with updated prices and references. It contains extra activities to consolidate and expand the material in the Coursebook (9781473610682) and grammar sections practising specific language points. As with the Coursebook, two main revision units summarise what has been learned, providing reading texts with comprehension and writing tasks. Ideal for faster learners or for practice of a specific area, the Activity Book can be used alongside the Pasos 1 Coursebook or as self-access material for learners of Spanish using any course. Activities include word searches, crosswords, cultural quizzes, extra reading and comprehension tasks, and gap-fill conjugation exercises. What is Pasos 1?A best-selling multi-media Spanish course for adult learnersPasos 1, fourth edition, is the first part of the best-selling two-stage Spanish course for adult learners who are either starting from scratch or who have a basic knowledge of the language. Whether learning for work or pleasure, at home or in the classroom, Pasos gives a thorough grounding in the language, enabling learners to speak, read, write and understand a language spoken by over 400 million people. It has been fully updated and revised in this new edition. What will I learn in Pasos 1?Key language structures and communicationPasos 1 introduces the key structures of the language over 14 thematic lessons with the emphasis placed firmly on communication. Authentic reading and listening materials are used extensively for a wide range of lively activities based on everyday situations in Spain and Latin America. Vocabulary and grammarFrom the outset, a realistic range of registers and vocabulary encourage development of the essential skill of comprehension. Clear examples and explanations make the grammar easy to absorb, and emphasis is placed on the acquisition of a wide range of essential vocabulary from an early stage. Culture and skills for daily lifeThis edition takes account of developments in modern life, such as new technology and practical communication. Units begin with a Preparate page of activities and include plenty of grammar tasks. The Rincon Cultural feature presents short texts of cultural interest and each unit ends with an Autoevaluacion self-assessment checklist enabling students to review what they have learned. Audio track references on a page-by-page basis ensure that listening activities are easily identified and online resources provide extra practice of essential language. The new video, filmed entirely in Spain, brings authentic culture and language in the classroom. GCSE level materialPasos 1 covers the skills and structures required at GCSE level and equivalent. How will I learn?Balance and varietyBalance and variety are prominent features of the Pasos course: freer activities accompany graded, accuracy-based tasks, and there is a balance between presentation and practice of new language items and between the study and use of grammar and vocabulary, the cornerstones of language-learning. There are regular opportunities for revision and consolidation, and vocabulary and grammar support are given both at the end of each lesson and in full at the end of the book. Interactive quizzes and exercisesBrush up and reinforce your learning at home, with fun, interactive online quizzes and exercises. Or use them in class with the group. Speaking and Grammar guidesWith speaking becoming ever more important in today's accreditations, the Pasos 1 range offers a 2-CD Speaking and Listening Skills Practice Set. There is also a dedicated Practical Grammar reference and practice book. It contains clear, accessible grammar explanations with examples and extension in both Spanish and English. Group or independent studyPasos 1 is ideal for group study and is also useful for independent study and revision. What is new in the fourth edition? 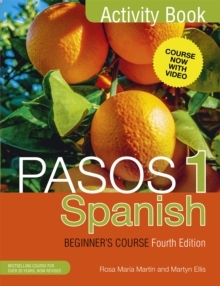 (NEW) Pasos 1 CD and DVD set: Supplementary to the Coursebook. Filmed entirely in Spain using native speakers, this brand new resource contains 12 colourful episodes which tie in with the lessons in the coursebook. Perfect for training students' listening skills, the Pasos 1 video is designed to reinforce vocabulary and language structures while adding an additional cultural element to the course. It also provides the ideal basis for group discussions. There are numerous linked activities for use in class or for self-study, which can be found in a new section at the end of the coursebook. Optional sub-titles will help students to find their way through each of the episodes and give them the confidence to approach spoken Spanish with real understanding. Improvements and additionsThe new edition has improvements and additions based on ideas and feedback from teachers and learners across the country. It has been fully updated and includes a wealth of new, contemporary photographs. A brand new section at the end of the book provides a range of activities linked to the DVD, available in the Pasos 1 CD & DVD Set or as part of the Complete Pack. 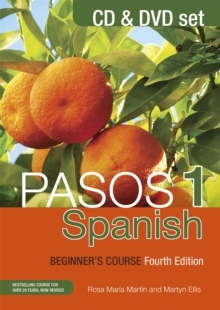 Where does the Activity Book fit within the Pasos 1 Range?Pasos 1 Coursebook: The primary text for the Pasos 1 course. Includes 14 thematic lessons and covers the skills and structures required at GCSE level and equivalent. 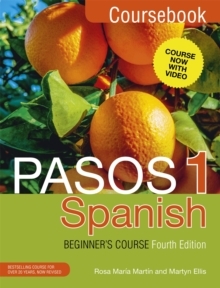 (NEW) Pasos 1 CD and DVD set: Supplementary to the Coursebook. All 12 videos are included on 1 DVD with optional subtitles. The Audio and Support book provides the listening element of the course, along with transcripts and answers. It contains:- 3 audio CDs (3 hours of recordings)- 2 Support Books containing a key to the exercises and recording transcripts. 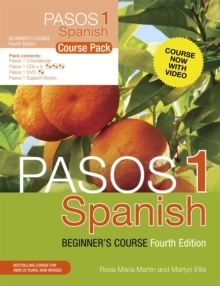 Pasos 1 Course Pack: Pasos 1 Coursebook + Pasos 1 CD and DVD set. The Course Pack contains:- 1 copy of the fourth edition of the Coursebook- 3 audio CDs (3 hours of recordings)- 1 DVD with 12 videos- 2 Support Books containing a key to the exercises and recording transcripts. Pasos 1 Activity Book: Supplementary to the Coursebook or Course Pack. The activity book is a workbook providing stimulating practice material that complements the tasks presented in the Pasos 1 Coursebook. Activities include word searches, crosswords, cultural quizzes, extra reading and comprehension tasks, and gap-fill conjugation exercises. 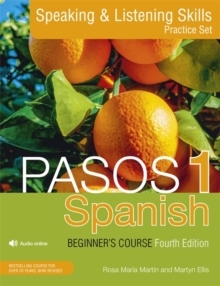 Pasos 1 Speaking and Listening Skills Practice Set: Supplementary to the Coursebook or Course Pack. Designed to help learners concentrate on and really improve their speaking and listening skills. This book with CD includes:- 2 audio CDs containing a wide variety of activities- a 144-page book packed with short exercises and transcriptsPasos Spanish Practical Grammar Book: Supplementary to the Coursebook or Course Pack. A reference and grammar practice book containing clear, accessible grammar explanations with examples and extension in both Spanish and English.